In 2007/8 I worked for Skills Development Scotland as one of the first embedded product designers inside a public body. We were explicitly looking at how design could be used to improve services from a user perspective, across end-to-end journeys. It was quite a leap for them to make, a trust in design as one of the skill sets they needed to develop services that work for people. With my subsequent Masters, I skirted around the edge of the Strategy Unit at Scottish Government, tracking how policy moved from there into public bodies and became the services we use every day. The formula, in the most basic terms, became policy = no design. 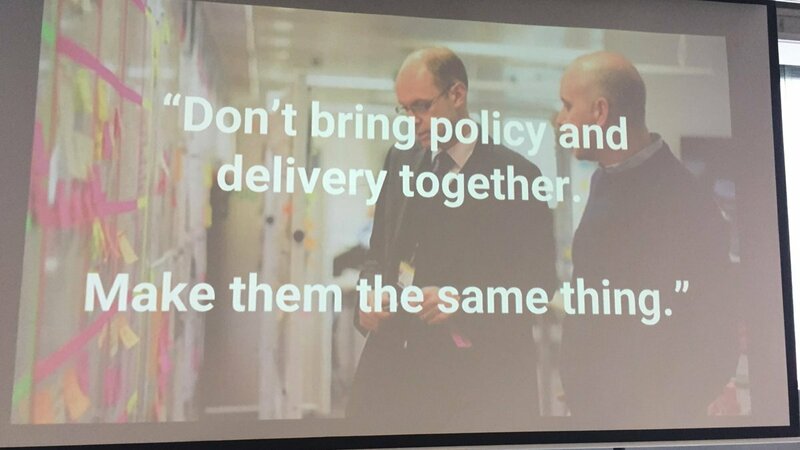 There seemed to a lack of integration in user needs, policy goals, service designs and the emergent digital landscape working together for better outcomes for citizens, somehow policy just seemed to get delivered as a ‘thing’. We hadn’t even started the Report on the Future Delivery of Public Services by the Commission chaired by Dr Campbell Christie, a landmark piece of thinking on, as he himself outlined, form should follow function. We now have some credible examples of digital done well, service design actually being commissioned and policy being iteratively tested. But we’re not all there yet, and let’s be honest, there never is a there. There’s just an ongoing conversation of us being better at what we do. A few weeks ago I went to #OneTeamGov in London. A fantastic event bridging all the disciplines and departments of people working in and around Government. I went, it was great, it will grow, it is growing. I said we should try it in Scotland. Lots of you reached out. So, here we are, One Team Gov Scotland. We’re going to try this — there’s enough interest growing do this and create a platform for people working across different areas in and around Government. There are lots of interesting groups forming across Government (and local) in Scotland having these kinds of discussions, and it isn’t just big Government, its health, education, third sector and more. The point of #OneTeaGov is to bring all of us together in a format that’s flexible for us all to make it what it needs to be for us. It’s an unconference format (with some seeded lightning talks to set the grounding at the beginning). This means you bring the agenda. But really why the #OneTeaGov format? This truly is about inclusivity. Other events sometimes cater for more digital types, or more design types, or more policy types, or more senior leaders, or frontline teams, you get the picture. This is really about saying, we’re all in this together and everyone is welcome. If you work in the interest of making public services better, then you are welcome, and that includes citizens too. We will be programming ways if you don’t feel confident to pitch in front of people or in a group discussion that some tracks in the day could be silent, or you can feed in your sessions ideas and we’ll read them out. We know for some an unconference style can be daunting if you’ve never taken part in it before so we’ll do our best in the design of the day to make sure it works for all of us. what is policy making? what is digital? what is service design? who is doing ‘the agile thing’ at scale, and how? We’re working to the end of November as a timeline and will firm up the date very soon. We think this skips most major events of similar nature and gives us something realistic to aim for. After this post, we will launch an Eventbrite with full details of venue, date, timings and agenda for the day. If you are interested in any of the following options from helping organise to just being notified about it, please sign up using this form, it will help us keep on top of the growing interest. We need help. We have a very small mixed organising committee of 5 people from both Scottish Government and external agencies who work with Government so we’d like to open it up wider. We want to ensure we get a balance of policy, design and digital across our team. If you’re interested in joining please let us know, we expect to have a call around every 2 weeks with some support work. If you can volunteer on the day to run, help serve food, document sessions, take photographs, film it that would be greatly appreciated, just let us know. If you can help promote, that is volunteering, get in touch. We need to cover venue, food, branded goods and covering all the sessions that will run with people. If you can support to either fund it, provide an in-kind resource or free up your staff time to get involved, let us know. If you can help promote across your organisation or network that would be really helpful. We want to ensure we reach senior leaders, frontline staff, policy, design, digital, operational, all of us. So we’ll need help to get the message out. Let us know if you’d like to support with that and we can give you some outline packs. Using our form, you can let us know all of the above and hear first when we’ll release tickets. We will be setting a split in ticket types to ensure we get a balance of people attending from different backgrounds and places. So that’s us, please use this form to let us know how you can get involved or stay in touch so you can help us organise the event. This is an experiment for us, it is our first time organising a #OneTeamGov event in Scotland so we will do our best to design this so it works. We’re coming at this only with a want to bring people together to have conversations and thinking they might want to around making a collaborative system work together. Image is taken from @vicwray on Twitter.